Are you looking for an aquarium air stone that provides good value and durability? After extensive research, we’ll reveal our top 5 best aquarium air stones on the market. Can be concealed under gravel. Efficiently produce bubbles and help with oxygenation. Ensures even oxygen supply to every section of your fish tank. Has 6 cool LED lights. Comes with 3/16 inch airline tubing and a power adapter. Great deal - 10 air stones per pack. Suitable for 3/16 inch airline tubing. 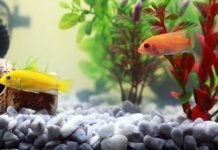 What is an aquarium air stone? The purpose of an air stone is to help provide your aquarium with oxygen, which your fish need to survive. An air stone creates flows of fine bubbles which transport oxygen all over the aquarium once they burst. The bubbles float to the top, where they agitate the water surface and help with oxygen exchange. Although an aquarium air stone isn’t necessary for a healthy tank, it can greatly improve the health and well-being of your fish. Considering how cheap it is, it’s almost a sin not to buy one. Air stones come in different shapes and sizes. The most common types you’ll find are disks, cylinders and bars and they all work the same way. Keep in mind that an air stone is useless on its own – it requires an air pump in order to work. The air pump produces oxygen, which is simply pushed through the stone. 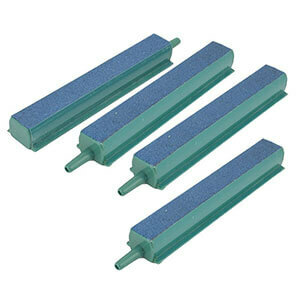 10 inches long and 2 inches wide, this aquarium air stone can be used in both freshwater and saltwater aquariums. The stone itself is encased in a solid plastic shell which keeps it in place and prevents it from floating. The blue color provides good camouflage for the stone – but if you dislike the color, you can conceal the entire stone underneath some gravel, which won’t affect its work. We found that it provides a large amount of fine bubbles, and will work great with a stronger air pump. 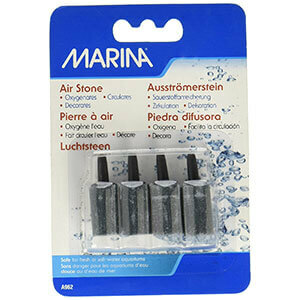 Marina is a renowned brand that specializes in high quality aquarium products, and these air stones are no different. We found that they work well and are fairly durable – all while having a great price. If you don’t need that many air stones, you can purchase the 2-pack version. We tried out the 4-pack one. You can divide the air stones into multiple aquariums, leave some as spares, or attach several stones to standard airline tubing for the best results. Each air stone produces a nice amount of bubbles and helps with the oxygenation of your aquarium. If you’re unhappy with their appearance, you can bury these air stones underneath the gravel to conceal them. 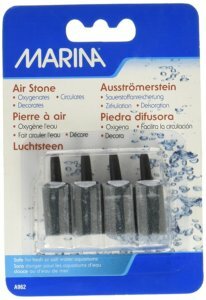 Similar to Marina’s Elite air stones, these come in 4 pieces per pack. Each air stone bar is 4 inches long, which ensures even oxygen supply to every section of your fish tank. We love that the blue-green colored air stone bars are not only functional but also make your aquarium look beautiful. Considering their size, they should be combined with a stronger air pump for the best results. Each stone is fairly heavy, weighing 1oz (120 grams), and this helps keep it in place, preventing it from floating. If regular air stones are too boring for you, this is a fun pick. The donut shaped air stone surrounds six LED lights, which slowly change colors and turn your aquarium into a lightshow. 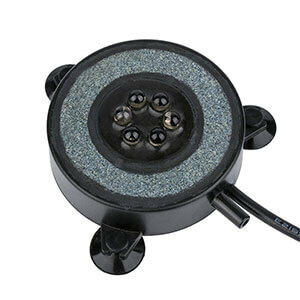 Suction cups are provided to help keep the device in place, which is a plus if you want to attach it to glass or the bottom of your pond. The diameter of this aquarium air stone is 2 inches. However, if you want a wider diameter, you can choose the 4-inch version. We found that the 2-inch version provides a solid flow of bubbles, but the included 5-foot power cord may be too short for some larger aquariums. Quality beats quantity – but it’s best when you can have both. A total of 10 pieces of these tiny air stones is included with each pack. Although each piece is just 1 inch in length, they do a fairly good job and will require an air pump of at least 2.5W to produce enough bubbles. There’s also a 12-pack version in which each air stone measures 0.6 inches. 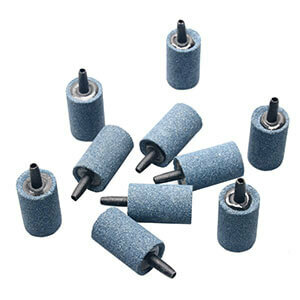 The air stones in the 10-pack version all have a cylindrical shape and they’re suitable for 3/16 inch airline tubing. Our #5 pick is a great choice if you have multiple fish tanks, or just want a good deal. How do I clean an aquarium air stone? Sooner or later, you’ll have to clean your air stone because over time, algae, micro-particles and bacteria will clog it. All of these particles usually collect in the stone’s little holes which create bubbles. You can clean an air stone by manually scrubbing the build up or by boiling it in water for several minutes to ensure that all the impurities are gone. Another common method is to soak it in a hydrogen peroxide or vinegar solution. Regardless of which method you opt for, make sure that the air stone is completely dry and clean before putting it back into the aquarium. My aquarium air stone is not working? The most common reason an air stone stops working is because of algae or dirt buildup, so before assuming that there’s a problem with it, first make sure that it’s clean. If it’s still not working, check the tubing that leads to the air pump. Is is the right size for your air stone? If it isn’t, then the oxygen flow won’t be able to pass through it properly and the air stone won’t produce bubbles. Another thing to pay attention to is the air pump itself, so inspect it for problems. A common mistake is attaching an air stone to a weaker air pump that simply isn’t powerful enough to work for it.